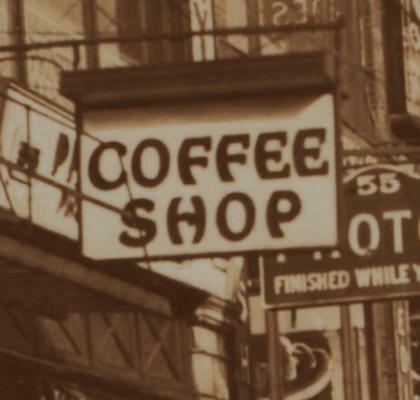 Before neon signs began to proliferate in New York during the 1920s, another type of electric sign predominated throughout the city. These were the so-called "panel reflector" signs. The concept behind them was extremely simple: they were comprised only of a painted signboard, illuminated by incandescent bulbs housed in a hooded fixture mounted to the top of the sign. Panel reflector signs are almost ubiquitous in early twentieth century street scenes of New York. New York Edison's 1927 Electric Sign Survey found nearly 6,000 of them in Manhattan below 135th Street, making them the most common electric sign typology in the city that year. They advertised all sorts of businesses, from independent shops and stores to chain businesses, like Nedick's. 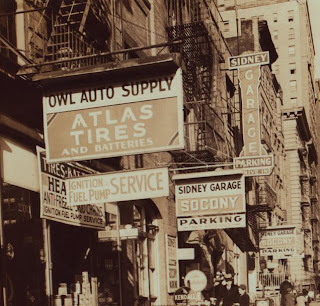 Panel reflector signs around New York in the 1930s. 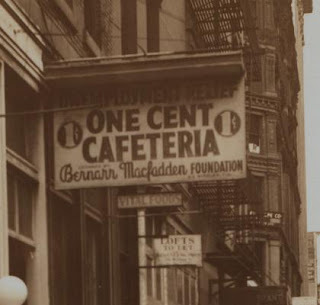 From top: Nedick's, at 6th Avenue and West 8th Street in Greenwich Village (NYU); Bernarr McFadden's One Cent Cafeteria, on Bleecker near Mercer; the Famous Coffee Shop, on 125th Street near Madison Avenue; the Sidney Garage at 69th and West End (NYPL). Today, however, they are very scarce indeed. Of traditional examples, I can cite just three in Manhattan. The St. Paul's House ministry on West 51st Street in Manhattan is known for its glorious neon cross, but its ancient panel reflector sign goes overlooked. Heading downtown, another classic panel reflector can be found at the Madison Avenue Baptist Church, on East 30th Street just off Madison. This very handsome sign is one of my favorites of any variety in New York, with great blackletter and script lettering, and stainless steel and porcelain enameled sheet metal. Its style and materials relate to the neon signs that largely replaced panel reflectors by the Second World War. Still further downtown, another fine panel reflector sign hangs over the door of the venerable Pete's Tavern, which traces its opening back to 1864. This sign has been updated somewhat, with fluorescent rather than incandescent lighting and what appear to be cut plywood letters. In its basic form, though, this example retains the classic characteristics of an electric sign typology that once characterized the New York streetscape, now nearly extinct.